In the world of drug trafficking, Frank “Black Caesar” Matthews was the first of a new breed. Born during the waning days of WWII, he spent his childhood in Durham, NC as a chicken thief. He decided to cut his education short in the seventh grade, and eventually made his way to Philadelphia, PA. After making a name for himself in the local numbers racket, he relocated to Brooklyn, NY. While working as a barber, he continued collecting numbers, but eventually decided to try his hand in the smack trade. Feeling that they had enough Black dealers under their employ, La Cosa Nostra refused him sponsorship. Undeterred, Matthews soon made the acquaintance of a Cuban Cocaine supplier. From there, Matthews went on to build a heroin and cocaine trafficking organization that encompassed 21 states. His unprecedented rise through the ranks of the drug trade earned him some formidable enemies, most notably the Gambino and Lucchese crime families of New York, as well as Philadelphia’s Black Mafia. The DEA also caught wind of his operation, and set out to shut it down. Alas, before any of the aforementioned factions could get ahold of him, Matthews simply vanished. Many believe he skipped the country with as much as 15 million dollars in tow. The rise and disappearance of Frank Matthews is one of the great mysteries of modern crime lore. It has been covered sporadically throughout the years in various books and magazine articles, most of which only managed to scratch the surface. Author Ron Chepesiuk has been researching the Matthews case for years, and his efforts finally come to fruition with The Frank Matthews Story: The Rise and Disappearance of America's Biggest Kingpin. The project has been six years in the making, and was finally completed in partnership with ace documentary filmmaker Al Profit. This collaboration has birthed a film that puts the most elusive fugitive of all time under a microscope. The Frank Matthews Story has a different feel than earlier Al Profit films, mostly due to it being a joint effort as opposed to the product of singular vision. It feels just a tad disjointed at first, but it does eventually find its own unique rhythm. In another deviation from the Al Profit formula, Mr. Profit actually appears onscreen instead of simply providing third person voice-over narration. Ron Chepesiuk also appears. Profit’s segments are reminiscent of Rod Serling’s introductions to various Twilight Zone episodes. Ron Chepesiuk comes across more casual. At first glance, this might seem to violate Gustave Flaubert’s rule about authors remaining present but unseen in their works. Contrary to that notion, neither Profit nor Chepesiuk come off as intrusive or indulgent. It makes the film seem more like a personal interaction than a passive viewing experience. The Frank Matthews Story never pretends to be a definitive portrait of its subject. It acknowledges all of the often conflicting views of Matthews’s character and personality. It also notes some of the “blind spots” in his story. It never offers suppositions or speculation as fact. As a result, Matthews emerges as a complex figure. He was all things to all people. The tone of the piece becomes conspiratorial during the segment on Matthews disappearance. The picture offered is considerably more vague than expected. It seems that nobody really knows the method, manner, or moment at which Matthews decided to make his exit. That vagueness notwithstanding, the film still proves ultimately satisfying by entertaining any number of theories as to what might have actually happened. The Frank Matthews Story: The Rise and Disappearance of America’s Biggest Kingpin is in the same tradition as Oliver Stone’s superb JFK. It leaves the viewer dizzy from information overload, yet begging for more. Like its subject, it proves the impossible to be anything but. One can only imagine what the next installment holds, as the first proves to be thrilling enough on its own. How could there possibly be more to this amazing story? Either way, this documentary is a must see. 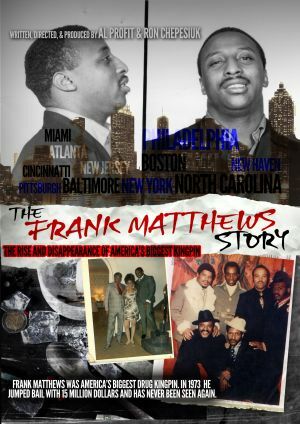 ‘The Frank Matthews Story: The Rise and Disappearance of America's Biggest Kingpin’ will be available through its website, http://www.frankmatthewsmovie.com/, via instant digital download. Physical DVD copies will be made available through Amazon.com and various other retailers.